Sam Goates is a textile weaver supplying bespoke woollen cloth to tailors, designers and small businesses. Woven In The Bone have weaving, hand stake warping and CAD facilities in-house. Production equipment includes a semi-automated Hattersley Domestic loom, 24-shaft dobby floor loom and table looms. Woven In The Bone can produce bespoke one-offs through to small batch production. Typical clients include tailors, designers, interior and fashion accessory makers. No previous knowledge is required if you would like to commission cloth – an idea of colours, quantity and timeframe is helpful, but you can just get in contact with an idea. Video: Make Works visits Woven In The Bone in Buckie. Sam Goates has over 25 years of textile design and production experience. 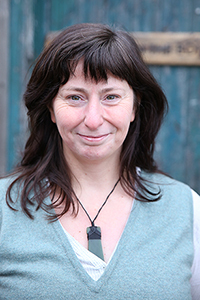 She has extensive knowledge of the wool and weaving industry and has been involved in the development of apprenticeships in the Scottish textile industry. She now produces handcrafted cloth on a Victorian designed foot-treadle loom from her studio in Buckie.